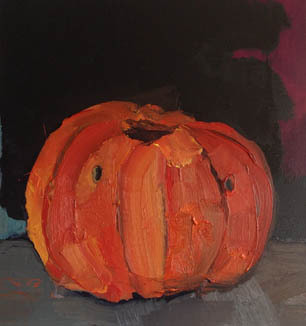 Michael Ajerman made his first pumpkin painting on a whim in 2004. As it lay collapsed and oozing on the floor, he seized the moment and began making a painting of it. That first painting came quickly, working against time to get it down strong and direct. Now, it has become an annual event and provides a breathing space in his practice that is concerned with a space between memories, sensations, and portraiture. Whilst the subject matter may look the same, each painting reflects different ideas and different years. Often perplexed about what to do with it, Ajerman spends a lot of time with each pumpkin. Finally, something happens and he has to make a decision, to carve a face or to choose the scale etc. Looking at something or someone has always been a part of his way of working. The amount of information provided by the pumpkin is abundant, allowing him to react and respond to the colour clearly, minimising the information and translating it with efficient gestures. Sometimes this information is used in sections to make the painting do something, but it is never a literal copy. His deceptively casual brushstrokes remind us that abstract marks made in paint can often make a subject seem more real, where paint itself provides a complexity that keeps us looking. 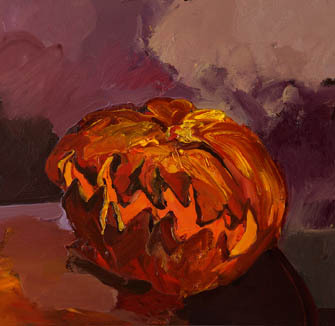 Through the pumpkins, Ajerman discovered an interest in objects that are hollow, concave, or have an internal empty space. This gives him the chance to solidify the exterior in some way through the act of painting. There is a menacing nature to some of the paintings, but also a twisted sense of humour. A stuffed toy in a teapot seems like a cannibalistic joke, which points to some amusement for the artist himself. For an American living in London, there is also an inherent sense of longing with the passing of each year that is made visible in these paintings and perhaps some nostalgia for home cuts through the humour and fluid marks. Ajerman uses a very specific palette of oranges, smudgy reds and puce, and although a great deal can be said about his relationship to Americana or self-portraiture, he is essentially a painter’s painter. Juicy swathes of paint mixed with finely observed details and luscious lines also suggest the sheer pleasure he takes in making work. Michael Ajerman was born in New York, and studied at the Corcoran School of Art and the New York Studio School. In 2003 he completed a masters degree at the Slade School of Art. That same year, he received the British Institute Award from the Royal Academy Summer Exhibition. He currently lives and works in London. Since then he has had solo exhibitions in the UK, Italy, USA and Israel including Fisherman, Strawberry and Devil Crab (2010) and Squash (2013) at Transition. He has been included in numerous group exhibitions including, Kunskog at 500 Dollars, London; East Wing Collection 8 at the Courtauld Galleries; The Painting Room at the Transition Gallery; and Bomberg’s Relevance at the Ben Uri Gallery.